Two sets of cousins, Boer and Brit, find their destinies inexorably intertwined in the politics and mayhem that led up to and encompassed the Anglo-Boer War of 1899–1902. From Transvaal to Victorian England, the cousins form strong bonds that are tested on the battlefields of South Africa. Through anger, injustice, and betrayal, the family discovers that there is a force stronger than war. Vividly realized and pulsing with passion and adventure, The Runaway Horses is the towering story of two families struggling against the tide of history. 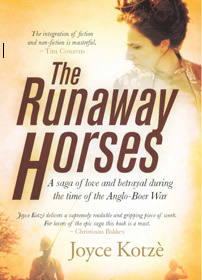 A sweeping family saga of love, loyalty and betrayal in the time of the Boer war.